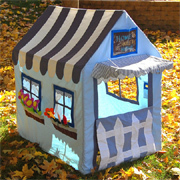 Enjoy sewing projects? 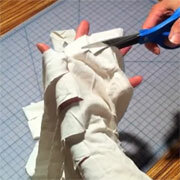 Chances are you have some scraps of fabric leftover and we look at how you can put fabric scraps to good use. If you need some extra storage in a kiddies bedroom or a place to store more shoes, this wall-mounted sling is an easy and attractive way to store items. 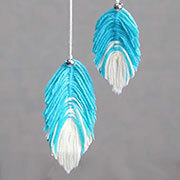 Use pieces of leftover wool to make feathers that you can use to adorn your own homemade dream catcher or make a colourful mobile for a nursery. 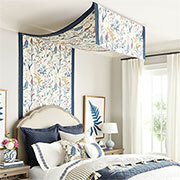 Fitting a beautiful canopy over the bed will create a beautiful statement in any bedroom. 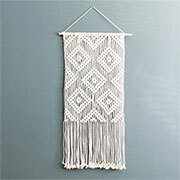 Diamonds are a girl's best friend and this beautiful macramé wall hanging features a diamond pattern that is easier than it looks. 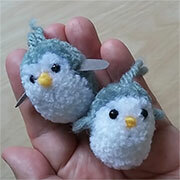 These cuddly wool baby penguins only need some wool scraps and you can make them for a nursery mobile, to embellish a key ring, or to hang on a wall. 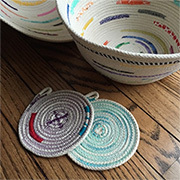 Baskets are a lifesaver for storage but they can also be pricey, so we've included a tutorial on how to make your own rope baskets. 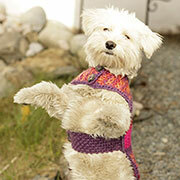 Don't let your pet shiver when it's cold - make them a cSosy dog coat to keep them warm in winter. 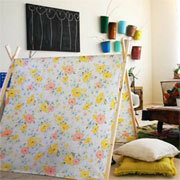 If you find yourself with time on your hands, fill those moments by crafting colourful squares to make a cosy blanket. 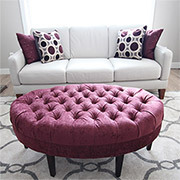 This beautiful tufted ottoman | stool was reupholstered and given a new lease on life. 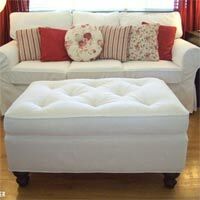 You can use the instructions to add a tufted top to a coffee table. 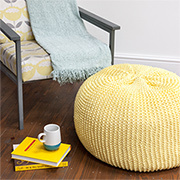 Whether you use leftover yarn or buy new, this pom-pom rug is super-easy to make and would look good in any size - in any room! 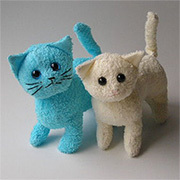 Felting is an easy way to make your own amazing creations using wool and a felting needle. 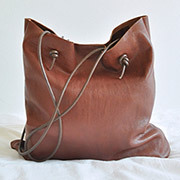 This stylish leather shoulder bag is a very simple project, and a great way to start off if you are looking for a new hobby. 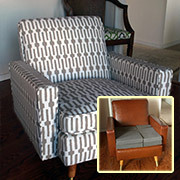 This dated vinyl armchair gets a makeover and a brand new lease on life. 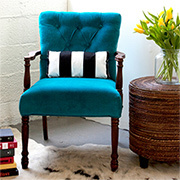 Find out how to upholstery your own club chair. 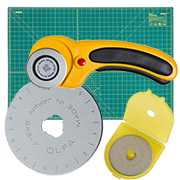 When you invest in an Olfa Cutter, you want your cutter and cutting mat to last a long time. 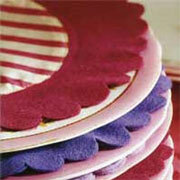 Here are some tips on caring for Olfa Cutters and Cutting Mats. We're always on the lookout for practical tutorials we can share, and these reupholstery tutorials offers precise, step-by-step instructions on how to reupholster an armchair. 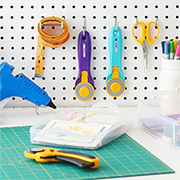 If you love to give your home a spring cleaning, don't forget about your craft space. This is an area that probably needs a refresh after busy months of sewing, quilting and projects! Add romance to any bedroom with a Moroccan wedding blanket. These gorgeous blankets are easy to make and look absolutely fantastic on a bed, or even as a throw. 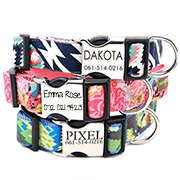 Dog collars can be pretty pricey, but here's a way to make your own unique dog collar at a fraction of the cost. 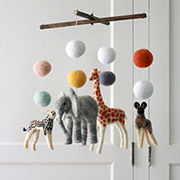 Felt is an inexpensive material to work with if you buy small squares, and you can buy felt in so many colours - making it the ideal material to use to make a colourful and fun nursery mobile. 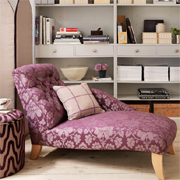 One of my favourite and most comfortable chairs is a tub chair. 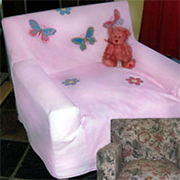 These days a tub chair can cost anywhere from R1500 upwards, but you can make your own for a fraction of the cost. Here's a very easy Mother's Day gift idea that the kids can make and mom will love. 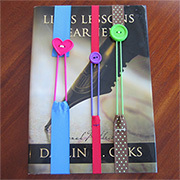 All you need is some colourful ribbon, a few buttons and hair elastics and a sewing kit. 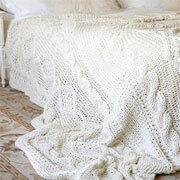 Knit a cosy throw... without knitting needles! Arm knitting is a funky new trend for anyone who wants to knit items quickly and easily without the hassle of using knitting needles. 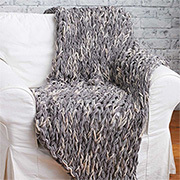 In this project we show you how to arm knit a warm, cosy throw blanket for cold winter evenings. This easy knitted throw has a colourful striped pattern and you can choose your own colour combinations to match your home decor. The chunky design means you can cover up on cold nights and stay snug and warm. It is possible to use a PC printer to print designs on fabric. 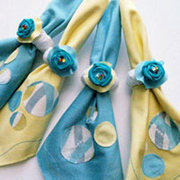 With this technique you can print out almost any design onto thin cotton fabric to make your own unique accessories. 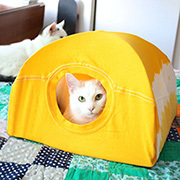 Find instructions on how to upcycle an old towel into a cute kitty. 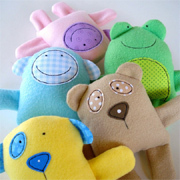 This is just one of many ways to recycle old towels or clothing into toys for children. With a basic sewing machine and a few practice runs you can soon discover how easy and affordable it is to make your own home decor accessories. Having upholstered with navy blue bull denim, I wasn't quite feeling the sense of achievement that I should. 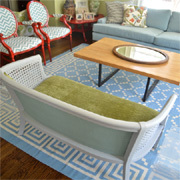 The sofa itself is perfect, but the dark blue fabric didn't add anything and I decided to swap with a different fabric. I have seen sun loungers similar to this, but this design has a couple of practical and eco-friendly differences. First, I used old pillows for filling the sun lounger, and second, it has an adjustable back. 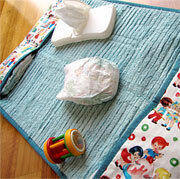 Basic sewing skills and some scraps of fabric are all that you need to make a cute and comfy mat for baby to play on. Filled with layers of soft batting, you can use this mat indoors and out. 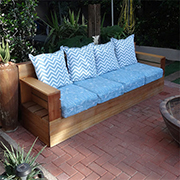 Now that I have finished my outdoor patio sofa I want to upholster in a navy bull denim. The only problem is that bull denim isn't waterproof, or stainproof for that matter. 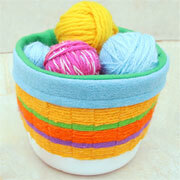 This colourful rope rag bowl is easy to make using scraps of fabric that you have lying around. 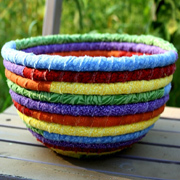 Use your own made rope rag bowl on a patio table to add a splash of colour, in a children's bedroom for storing small toys, or just to add a splash of colour to a room setting. 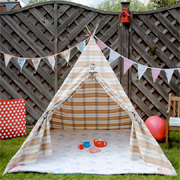 These three playhouse tents are made using a PVC pipe frame, a circular table and a couple of tension rods. 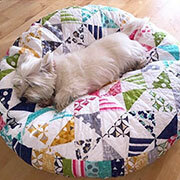 The fabric is scraps from duvet covers, sheets and fabric offcuts, which means they cost practically nothing to make. Discovering that my tablecloth had been decimated by fishmoths, I needed an urgent replacement. I had a piece of fabric left over from one of our projects and, since there wasn't enough time to dig out the sewing machine - I frayed the edges to make a fringe. 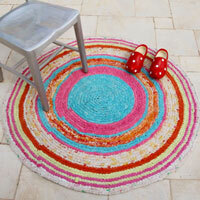 Use basic crochet to make a colourful rug for your home. 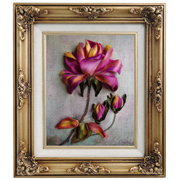 This rose rug is made up of different coloured roses that are sewn together. 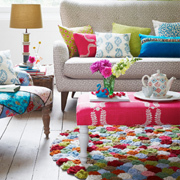 You can make the rug in your choice of colours and as small or as large as you want. 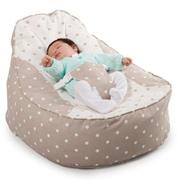 Baby bean bags or bean chairs are a practical and comfy way to have your baby by your side. The built-in strap ensures that baby is safe at all times. We even managed to find instructions on how to make a baby bean bag. 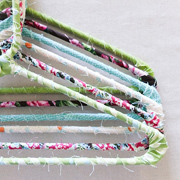 Wrapping your plastic hangers in colourful fabric scraps gives them a refreshing and charming appeal. 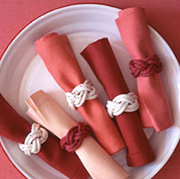 You can wrap them up roughly so that the loose threads are visible, or wrap them tightly for a cleaner look. 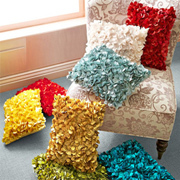 These petal cushions from Pier 1 are just the thing for adding colour and texture to your lounge. 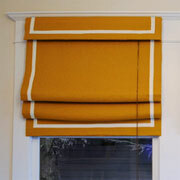 You can use fabric or felt in colours to match your existing decor, or punch up the fun by adding bold, bright colours. Still hoarding last year's t-shirts, despite the fact that they are full of holes? 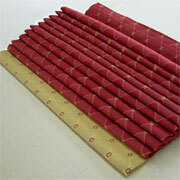 Time to cut them up and make this decorative cushion cover. You can use a single t-shirt, or combine coloured t-shirts for an even more decorative effect. 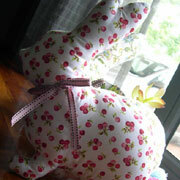 Quite a few of my readers who sew have requested sewing patterns for rag dolls and soft toys. I have found so many beautiful patterns and cute designs that I decided to share a few of these with you. 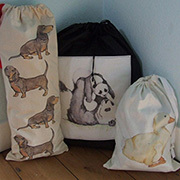 You can order these patterns online for immediate download. 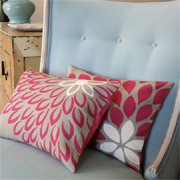 Here's an affordable way to add a splash of colour and pattern to any room by making your own cushions. 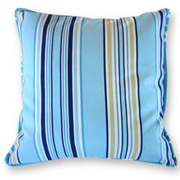 With their pretty patterned fronts and plain fabric backs, you can afford to make a selection of colourful cushions for your home. 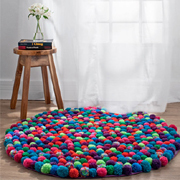 Here's a fun way to inject colour and texture into a room... with a pom-pom rug. 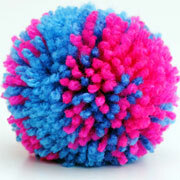 Making pom-poms is quick and easy and you can use bought or leftover wool to make a whole bunch of colourful pom-poms - or choose a single colour for your pom-pom rug. 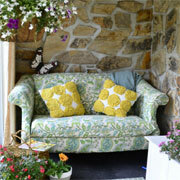 When choosing fabric for upholstery, you should be aware of its durability, be easy to clean, and resistance to fading. 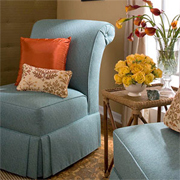 Here are a few tips to guide you in choosing the right upholstery fabric. 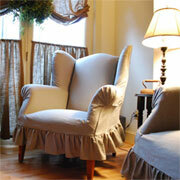 I stumbled across this post that shows how you can recover a really grubby armchair without using a sewing machine. 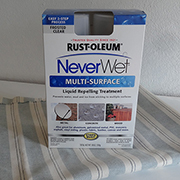 The project uses sprayable adhesive that you will find at your local Builders Warehouse. 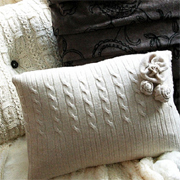 Looking for ideas to transform an old sweater, jumper or jersey into a wonderful cushion cover? Here are some great ideas that you can put to use. 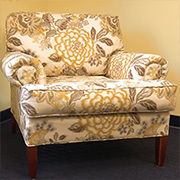 By learning just a few basic upholstery techniques and methods you will be able to re-upholstery worn and faded pieces, or make your own pieces of upholstered furniture. 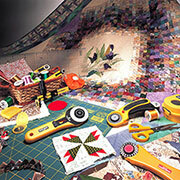 There are several tools and accessories that make upholstery easier and provide a more professional finish. 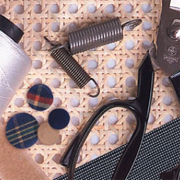 So here are some upholstery accessories, supplies and tools that you will definitely find useful. 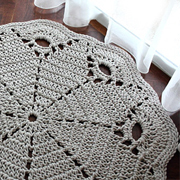 Joanne at Craft Passion shows how to make your own gorgeous doily rug using sash rope and a large crochet hook. A giant doily rug or floor mat is one of the most sought-after and you will find plenty of doily rugs on the Internet. .
Di van Niekerk is the author of ten books: Di van Niekerk’s Roses in Silk and Organza Ribbon, A Perfect World in Ribbon Embroidery & Stumpwork, Flower Fairie in Ribbon Embroidery & Stumpwork, Embroidered Alphabets with ribbon embroidery, amongst others. Pop over to West Elm and you will see these gorgeous dhurrie poufs. I think they are fantastic, but so is the price. They sell from around R2600 each - and that's without the shipping cost. Way too pricey for me. Giant knitting is the latest trend for home decor, and the bigger the knitting needles the better...! have only been able to find extra large knitting needles and these aren't big enough for some of the projects shown here, but it's easy enough to make your own knitting needles. 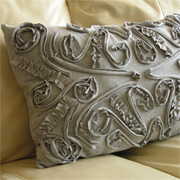 Cushions are always the perfect fast and easy project. 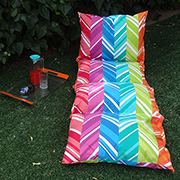 We designed a great trio of cushions: there's a 60cm x 60cm jumbo cushion, an all-around 50cm x 50cm cushion and a comfy 30cm x 50cm lumbar cushion. 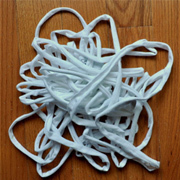 T-shirt yarn is great for recycling old t-shirts you never wear, and turning them into something more useful. 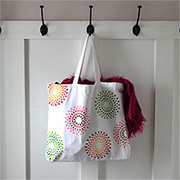 By making your own t-shirt yarn you could then use the yarn to make rugs, bags and baskets, and even a pouf or two...! Here is my first project for the new year. 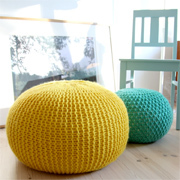 I have been dying to make one of these oversized poufs for ages and have just found the pattern for it on Etsy. 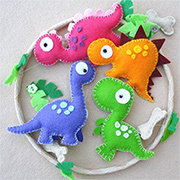 Using embroidery hoops for embroidery is a craft that has been around for hundreds of years. 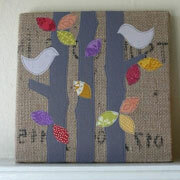 The new take on this craft is to add felt and fabric to create mini works of art. If you're driving down to the coast for holidays, or up north to visit relatives, this car organiser will ensure a smooth, 'whine-free' trip. 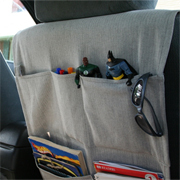 The kids can pack all their toys away in the car organiser and they're easy to find without bothering mom or dad. 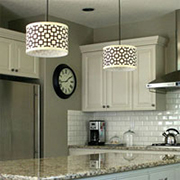 If I hadn't seen these beautiful crochet lampshades when writing this article I would have laughed. Who on earth would want a crochet lampshade? 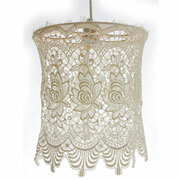 Now I am seriously considering making up a crochet lampshade for me dressing room. 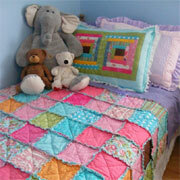 Quilts are a wonderful way to decorate a bedroom. 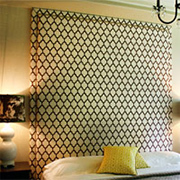 You can incorporate a variety of fabrics, textures and colours in one go to match any style of room decor. 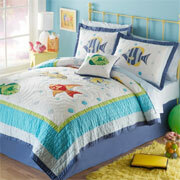 They are also more personal than bought bedding and you can custom design a quilt as you wish. I just HAD to share these projects with you. A really cute way to sew up towels hooded towels that resemble monkeys, angry birds, a dinosaur and a ladybird... to cute! 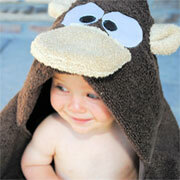 These hooded towels are easy to make, inexpensive and wonderful to use with little ones! An easy way to cut a continuous length of t-shirt yarn and then join together long lengths of t-shirt yarn in an almost invisible way. 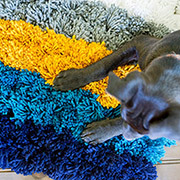 You can use this technique when making rag rugs or mats with crochet, a knitting fork, or with a handmade loom. A gift for the man who has everything! 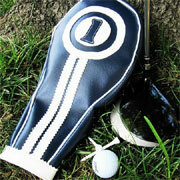 If you have some basic sewing skills, this project shows how to make a pleather cover for golf clubs. Of course, you have the option to use pleather or leather, but remember to use the right sewing-machine needles for either one. If you learn how to knit you can be creative in so many wonderful ways. A few basic stitches are really all that you need to know if you want to knit blankets and cushion covers. 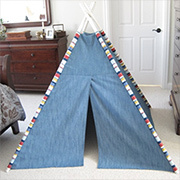 Not everyone has the space or is inclined to “camp” in their garden, but it’s still fun to pitch a tent indoors and Rubyellen of the blog 'Cakies' has designed and built a beautiful indoor a-frame kids tent and has shared this project with us. Green Wedding Shoes designs for weddings, and as part of the design process they are often called upon to come up with unique wedding decor ideas. 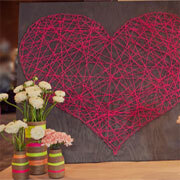 This string art heart is one of those decor projects. I think it would also look good on a bedroom wall. 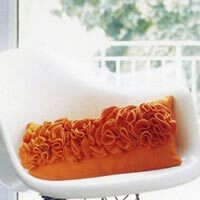 Once you discover how easy and affordable it is to make your own scatter cushions, you will also realise how creative you can be. 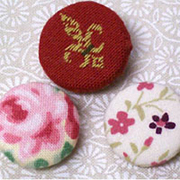 Small pieces of fabric, buttons and embellishments go a long way towards creative unique decor accessories for a home. 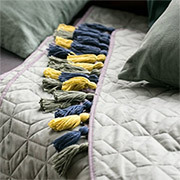 Winter might be over, but that gives you plenty of time to get started on this cabled bed throw. 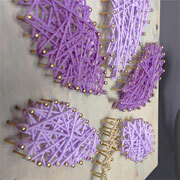 Ideas magazine is one of my fave mags, and I just had to share this project with you. 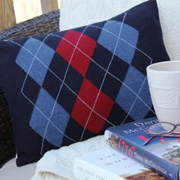 This bed throw or blanket is designed and knitted in panels, which are then sewed together. I have recently posted an article on the resurgence of string art. 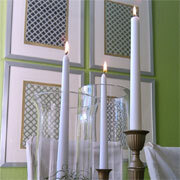 This is a fun way to create your own colourful and dramatic art with only a few accessories. 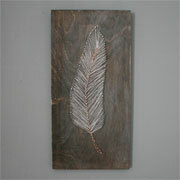 If you start off with a small string art project, you will soon be creating intricate masterpieces for your home. Wanting a unique piece in the kitchen? 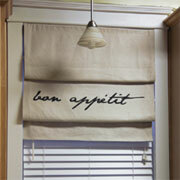 You can easily make your own personalised Roman shade with scripted text. Here is a great project you can whip out in a weekend. 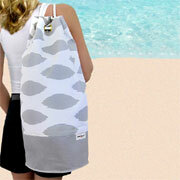 This designer beach bag is a wonderfully tall tube, perfect for loading with all your sun and fun supplies. 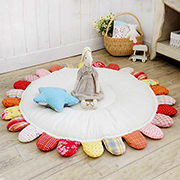 Decorating a nursery is such a loving project to undertake and being able to repurpose items that you already have to add personal touches can save you a lot of money. 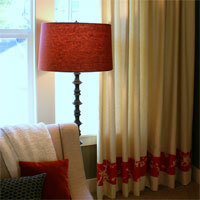 Here's how to use an old lamp shade and transform it into a beautiful fabric rose lamp for a nursery. 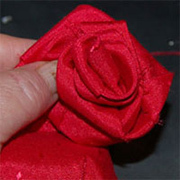 Make your own fabric roses that look great in any fabric and can be applied to various projects. 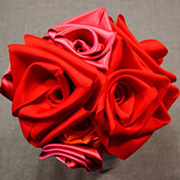 Fabric scraps and old clothes are perfect for making fabric roses and you can add as accents on shirts, hats, headbands and lamps. You can make these hanging fabric baskets in any size, hang on bigger thicker rods for more drama, or single baskets hung one over the other in a narrow space - so many storage possibilities. 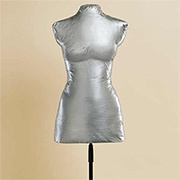 For some time now I have wanting to make myself a lingerie bag. A little drawstring bag that I can use for my underwear for washing. 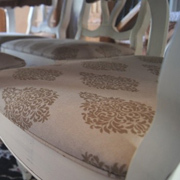 It's not easy to upholster an old sofa or couch, but it's not that difficult either. If you are prepared to put in the effort, reupholstering an old sofa or couch can save you a lot of money, either spent of sending the piece out or buying a new sofa or couch. Inspired by nature, this design features two birdies calling to each other through the woods at sunset. 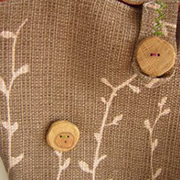 For this project, I used part of a burlap coffee sack as my canvas and small fabric scraps to create my picture. I know it's not Easter, but I just had to share this project. 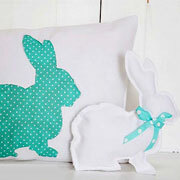 These little bunny cushions are super easy to make, even if you aren't very good at sewing! When it come to projects - the bigger, the better, and that applies to my crochet as well. 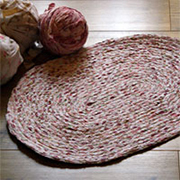 I have been wanting to make a cotton rug for ages but didn't want to sit forever with thin cotton thread and tiny hook. So, as usual, I decided to go big by making my own super-sized crochet hook. Sew up a portable baby changing bag that offers a ready-made soft surface to lay baby on, and can carry spare nappies and wipes. Plus this changing station is machine washable. 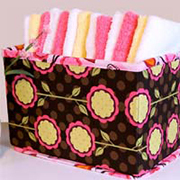 Shop around for colourful fabrics to make your own portable baby changing bag. 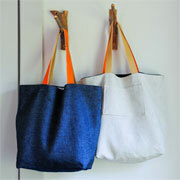 I love cotton tote bags. If you make them out of a fairly thin cotton, you can easily fold them up and carry a few with you in your handbag, and quickly pull them out when you go shopping - no plastic bags necessary thank you very much! Snuggle up with a faux sheepskin knitted cushion for warmth this winter, or knit one to add texture to a living room sofa. 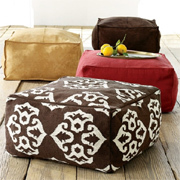 The cushions measures 45,5 cm square and has a solid fabric back. These warm and comfy slipper socks are durable and attractive and you can wear this around the house to keep you comfortable during the colder months. Plus they make a great gift. 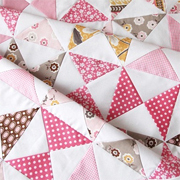 I have always wanted to learn how to do quilting but I'm just not sure that I have the patience. For those of you who want to get started in quilting, here's a nice and simple project that provides a good beginning for anyone wanting to start. 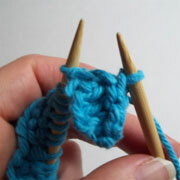 What's the latest craft craze... knitting with a fork. 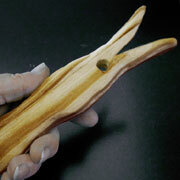 Not your average fork, mind you, but a carved wooden fork. Since I haven't been able to source a knitting fork locally, as usual I decided to make my own! Add hand made pom-poms to a luxurious faux fur blanket to keep warm and snuggle in the colder months. And, as we head towards autumn, this is a great project to do now. Today I woke up and felt a distinct chill in the air. Amazing when you think that last week was hot and sweaty. 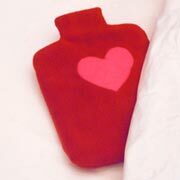 Microwaveable rice bags stay warm and don't slip around. How cuddly are these fleecy bunnies. Wrapped in a soft, brushed cotton with a snuggly filling. 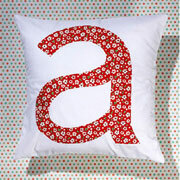 I think they would look lovely made with matching fabric and placed upon a little girl's bed or for a nursery. 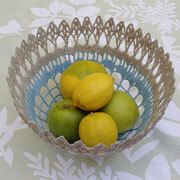 Once you discover how easy it is to crochet you will be able to make gorgeous items for your home. This project shows how to make a baby blanket using pretty basic crochet stitches - either for your own nursery or as a gift. Creative Jewish Mom has some really great ideas on her blog, but this one really caught my attention. While the project features fabric stiffener - if you can't find fabric stiffener - Mod Podge or acrylic sealer works just as well. Isn't this the cutest thing you have ever seen! 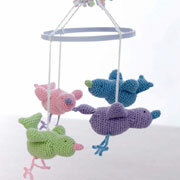 Pretty crochet birdies on a mobile to hang over baby's bed. This week we are featuring a home made weaving loom for the kids, and I thought it would be nice to incorporate a weaving project for the grown ups as well. String art designs are popping up all over the Internet. 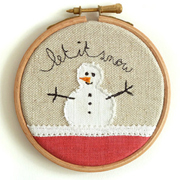 It's a fun and affordable way to get creative and make your own artwork with nothing more than embroidery thread and some pins. 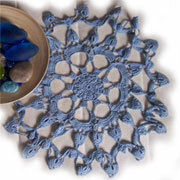 I have recently posted quite a few articles that use doilies for various projects. 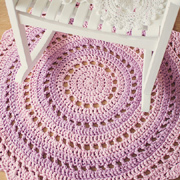 Whilst never really being a crochet fan, I am going to try my hand at some of the crafts posted, or try to get my hands on some vintage doilies. 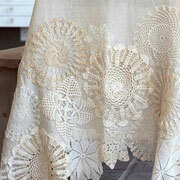 Using doilies and lace is one of those crafts that appeared to go out of fashion for a while - the kind of craft that only your granny did - and is now back in fashion with a new take on techniques and designs. 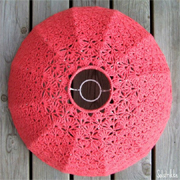 In part one we showed you how to use lace to create a lamp shade. 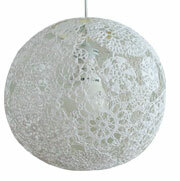 In our second part of making your own lamp shades, we show you how to use lace doilies to make a ceiling pendant. Lace lamp shades look stunning over a romantic dining room table, in a bedroom, or as table lamps and they are simple to make. Slipcovered wingback chairs are practical - you can take the cover off to wash - but if your prefer your chairs to be more stylish, then you need to consider reupholstering a wingback chair. 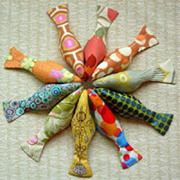 If you have odds and scraps of fabric at home, we've come across so many unique and wonderful ways to use fabric scraps. Feeling all soppy and romantic this year? Or perhaps you would like to do something different this year. Crafty Sisters have a wonderful red felt heart wreath that is fairly simple and only requires a few basic crafting tools. 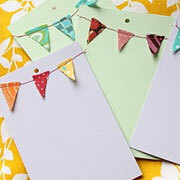 There are so many ways to make your own gift cards. In this project we show you how to make a crocheted wreath to decorate plain cards to create a gift card that really says "Thank You". 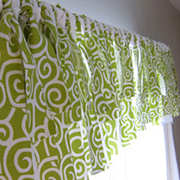 Bamboo blinds are a nice option for windows, but when you get tired of the look or want something different, instead of throwing them away, cover them with fabric and give them a new life. Framed fabric and prints is just one of the easy ways to add interest to a plain wall, or create an instant feature on a wall. Crocheting rugs from recycled sheets, comforter covers and pillow cases is simple and the results are great! 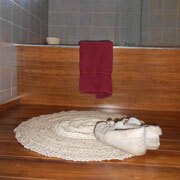 The rug is heavy-weight and can be thrown into the washing machine for cleaning. A visit to your local fabric store will have you drooling over all the gorgeous ribbons, and there are so many ways to use ribbon to dress up fabrics, furniture and everyday home items to transform them from drab to fab! 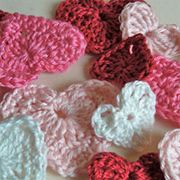 Crochet is making a come back into the crafting scene and I for one love the new, trendy designs that are appearing. 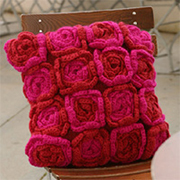 This gorgeous rose cushion cover is just one of many crochet projects I will be featuring on Home-Dzine. 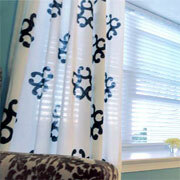 Recently I came across a window treatment that I loved but was a bit too costly for my budget. When I looked closer, I thought it would be so easy to make myself at a fraction of the cost and without sewing a stitch. 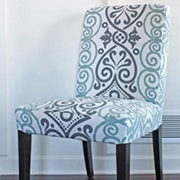 Reupholstering your dated dining chairs is an easy and affordable way to have new chairs done in a fabric you love - without the expense of buying new chairs. 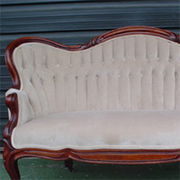 In this project we show how a worn and shabby Victorian loveseat is stripped down to the frame and then padded and reupholstered into a beautifully restored piece. Customise your curtains with a decorative band of fabric for a custom look and the perfect curtains for any room in your home. When pruning bushes and trees, look for nice branches that you can turn into your own wood buttons. 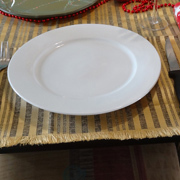 Set the table with this matching serviette and napkin ring holder - in pretty blue and yellow. 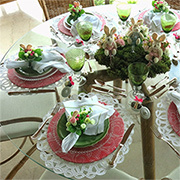 The rhinestone flowers will add a touch of glitz to any table. Crochet is a fun and relaxing hobby that is easy to learn and you can easily create your own beautiful fashion and home décor projects. 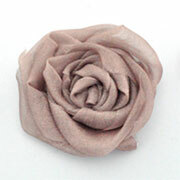 These little ric-rac flowers are adorable - you just want to put them everywhere! 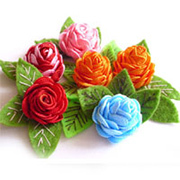 Some assorted ric-rac, scraps and felt and a few other tools are all you need to make these gorgeous buds. Fabric roses are everywhere I look these days, and they are so cute and adorable that I decided to make up a few to put onto the lamp project that I am working on. 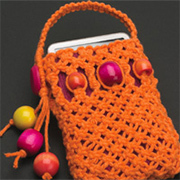 Here's how to make a storage pouch for an iPod or cellphone using coloured macramé cord. 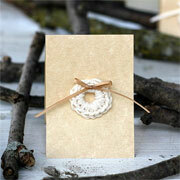 A few pieces of cord are all that is needed to make these knotted serviette rings for a special occasion. 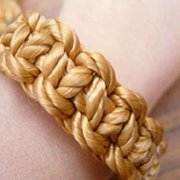 Start off with our easy macramé bracelet and then move onto more difficult projects. 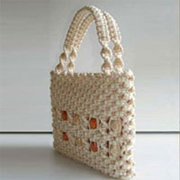 If you're feeling more confident with macramé, try making this macramé shoulder bag. 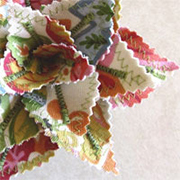 Use up all your fabric scraps to make these beautiful fabric flowers. 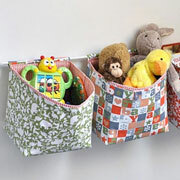 Here's a clever storage ideas for the nursery or children's bedroom. They're not only cute and handy, they're also a secret recycling project. I know of several people that create wonderful rugs from fabric scraps and plastic bags, and they look great in a cottage bedroom or bathroom and are perfect for outdoors on the patio. 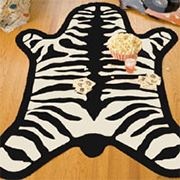 Non-fraying felt makes this project a cinch, and the zebra motif will have your family and friends demanding where you found it. It's so simple you can adjust the technique to make a rug in just about any size or style. 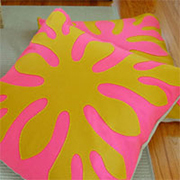 Use felt to create eye-catching cushions. 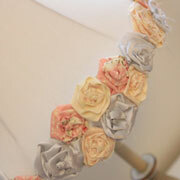 Learn how to make beautiful and simple ribbon flowers! 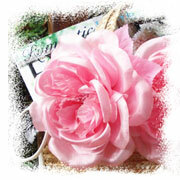 Make a bunch and have lovely flowers that bloom on and on! 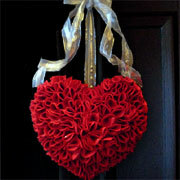 This is a perfect project for Valentine's Day or a wedding in need of some handmade touches. 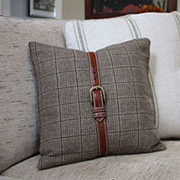 Adding new cushions to your home is a quick and easy way to warm up your home decor for the winter months. I recently stumbled across this project and thought it was a nice one to share with you, plus the fact that you don't need any sewing skills for it! 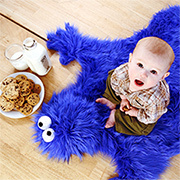 Does your little guy like to get handy around the house? 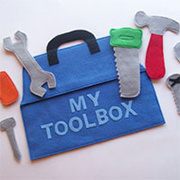 Here's a way that he can help you with everyday DIY - with his very own toolbox! This project shows you how you can cover your own buttons - without a kit - to decorate cushions, upholstery or a headboard. I have always wanted to make some colourful applique cushions for the floor, but I find the time consuming process rather daunting! Recently I started thinking about a way to simplify the process and felt popped into my mind. I had been toying with the idea of a mobile project and our adorable bird pattern seemed the perfect fit. I knew it would be gorgeous! 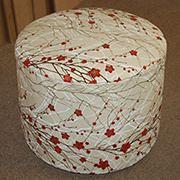 I have been coveting a coffee-table ottoman, but the R3000 price tag is a bit out of my price range. Then I found this secondhand ottoman for R250. 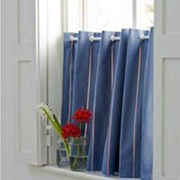 Brighten up your window with a colourful cafe curtain. I am sure that many of us have an old chair hidden away somewhere with a death sentence waiting to be passed. 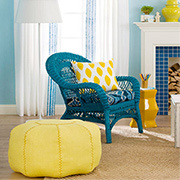 Here's how to make a simple slipcover. 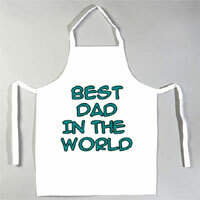 A braai apron is something that every dad will appreciate, especially when you add your own unique message! 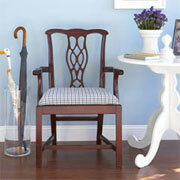 Use basic upholstery techniques to give an old, outdated chair a new life.